※ If you click the link to open the PDF file. 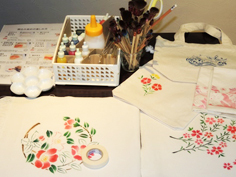 In type is Ise paper pattern of Edo, Kyoto and Kaga komon of kimono will handle pattern designs such as (pattern), a technique to fit the original Paste the original in this Ise paper pattern cut out the paper with a cutter is engraved. 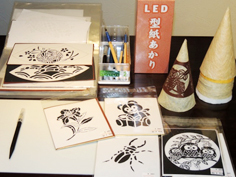 Colored paper, or to select whether the paper Akari (tabletop lantern), you can enjoy the experience of the top type carved next to choose your favorite design. Coaster or purse, to select the material to be dyed, such as tote bag, then stained to pallet will choose the paper design of your favorite hope of sliding inclusive sliding crowded color scheme to rub use the brush after making a color It is complete when you are. 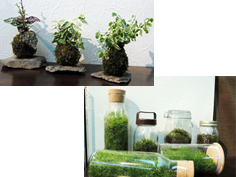 Kind of moss that can be manufactured experience to choose There are 1800 species of moss in the country will change Hosobaokinagoke, Haigoke, Kamojigoke, Sunagoke, Umasugigoke, even time in such Sphagnum palustre. 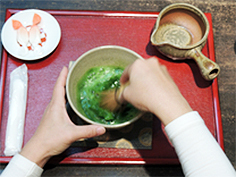 Although the origin of the Japanese tea ceremony is what you want to experience in the emotion of the tea room space through the dark brown rust Wabi, in our shop were carefully selected from anyone feel free to producing area of ​​the country of tea leaves to get close to the tea Kyoto Uji of light brown and green tea (Osusuki), you can stand you in your own tasteful the Shizuoka Kakegawa deep steamed tea of ​​the tea leaves.